This section is for Application Developers and Network Administrators who are looking to integrate Group Based Policy with OpenStack. Base GBP feature set, such as policy resolution, data model etc. For this release, GBP has one renderer, hence this is loaded by default. REST calls from OpenStack Neutron are by the Neutron NorthBound project. GBP provides the implementation of the Neutron V2.0 API. The Neutron port is mapped to an endpoint. The current implementation supports one IP address per Neutron port. An endpoint and L3-endpoint belong to multiple EndpointGroups if the Neutron port is in multiple Neutron Security Groups. The key for endpoint is L2-bridge-domain obtained as the parent of L2-flood-domain representing Neutron network. The MAC address is from the Neutron port. An L3-endpoint is created based on L3-context (the parent of the L2-bridge-domain) and IP address of Neutron Port. defines a L2 name space. To represent this, a Neutron Network is mapped to multiple GBP entities. The first mapping is to an L2 flood-domain to reflect that the Neutron network is one flooding or broadcast domain. An L2-bridge-domain is then associated as the parent of L2 flood-domain. This reflects both the L2 transmission domain as well as the L2 addressing namespace. The third mapping is to L3-context, which represents the distinct L3 address space. The L3-context is the parent of L2-bridge-domain. Neutron subnet is associated with a Neutron network. The Neutron subnet is mapped to a GBP subnet where the parent of the subnet is L2-flood-domain representing the Neutron network. GBP entity representing Neutron security-group is EndpointGroup. External EndpointGroup - holds L3-endpoints representing Neutron router gateway ports, also associated with FloatingIP ports. 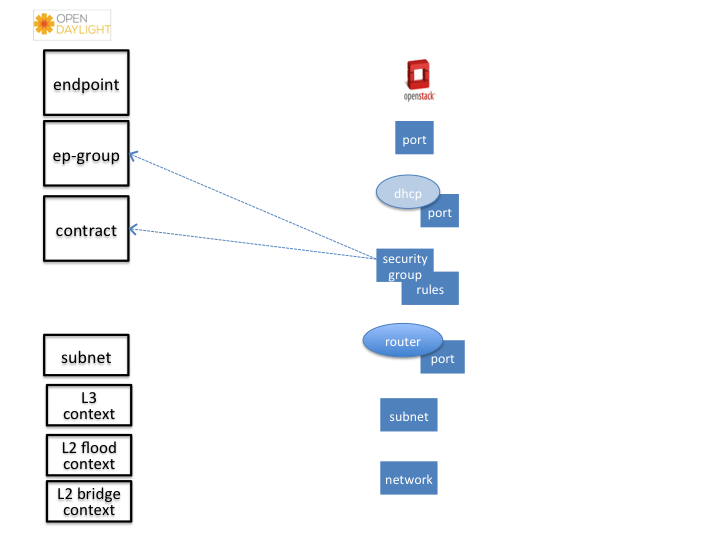 Neutron router is represented as a L3-context. This treats a router as a Layer3 namespace, and hence every network attached to it a part of that Layer3 namespace. This allows for multiple routers per tenant with complete isolation. The mapping of the router to an endpoint represents the router’s interface or gateway port. When a Neutron router interface is attached to a network/subnet, that network/subnet and its associated endpoints or Neutron Ports are seamlessly added to the namespace. When associated with a Neutron Port, this leverages the GBP OfOverlay renderer’s NAT capabilities. A dedicated external interface on each Nova compute host allows for disitributed external access. Each Nova instance associated with a FloatingIP address can access the external network directly without having to route via the Neutron controller, or having to enable any form of Neutron distributed routing functionality. Assuming the gateway provisioned in the Neutron Subnet command for the external network is reachable, the combination of GBP Neutron Mapper and OfOverlay renderer will automatically ARP for this default gateway, requiring no user intervention. As an example for mapping can be used creation of Neutron network, subnet and port. When a Neutron network is created 3 GBP entities are created: l2-flood-domain, l2-bridge-domain, l3-context. After an subnet is created in the network mapping looks like this. If an Neutron port is created in the subnet an endpoint and l3-endpoint are created. The endpoint has key composed from l2-bridge-domain and MAC address from Neutron port. A key of l3-endpoint is compesed from l3-context and IP address. The network containment of endpoint and l3-endpoint points to the subnet. No intervention passed initial OpenStack setup is required by the user. More information about configuration can be found in our DevStack demo environment on the GBP wiki. For consistencies sake, all provisioning should be performed via the Neutron API. (CLI or Horizon). A DevStack demo environment can be found on the GBP wiki.